3 Metres (or more if you use the mulitple purchase option) Top quality. 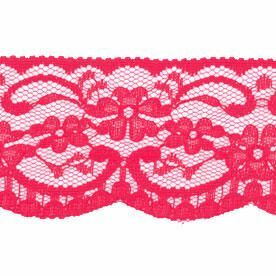 Flat red lace 2 inches wide (5cm). Made with matt yarns,scalloped border to one side. Brand new,perfect and to be cut from the roll. (Multiples will be supplied as as one uncut piece). Perfect for all types of projects.GOTH/TRIMMINGS/CRAFTS. If you would like a sample,please send a SAE (Address details are on my About Me page. For multiple purchases,postage will be combined,so if more than one is required,please order together. Why Not Take A Look At My Other Items. ITEMS ARE SENT OUT WITHEN TWO WORKING DAYS BY 1ST CLASS POST.